Violette L. Meier is an Atlanta-based speculative fiction writer, poet, folk artist and published author of eight books. 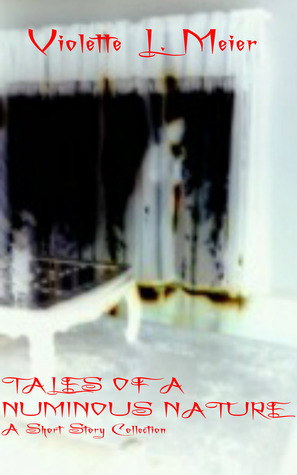 Tales of a Numinous Nature is a spine tingling collection of her short horror stories. She writes horror-tinged paranormal tales like Ruah the Immortal, The First Chronicle of Zayashariya: Out of Night, Angel Crush, and Son of the Rock. Her other titles include: Violette Ardor: A Volume of Poetry, This Sickness We Call Love: Poems of Love, Lust, & Lamentation, and Loving and Living Life. Tales of a Numinous Nature is a spine tingling collection of short stories that are sure to entertain. Meier’s eerie tales will delight you as you teeter between fear and fancy. Enjoy a world of specters, spooks, and shadows….if you dare! 1. How long have you been writing horror and paranormal romance? I have been writing horror and paranormal since I was a teen. The supernatural has been an obsession of mine since childhood so it was only natural that I gravitated to that genre. It’s very difficult for me to write any kind of prose without supernatural elements. Although some of my books have romantic elements, the closest one to a paranormal romance would be Ruah the Immortal. 2. Where do you get your ideas for your monsters and supernatural creatures? I love antiquity. Ancient religions, myths, and legends give me the greatest inspiration. 3. Are any of your characters and themes Afrocentric, and are any African Diaspora mythologies used to craft your fictional worlds? All of the main characters in my novels, except my science fantasy “Out of Night, where the characters are all supernatural creatures” are people of African American descent. Although I am inclusive of others, it is paramount for me to write people who are like me. 4. How do you feel about being included on the Black Women in Horror list? I am very honored to be included with such innovative and talented women. I’m looking forward to a new found sisterhood. 5. What is your latest (or upcoming, if you’re working on something) work about? I’m working on “Archfiend” the third book of my “Angel Crush” saga. I’m also working on a few short stories for different anthologies. The Angel Crush saga consists of “Angel Crush”, “Son of the Rock”, and soon “Archfiend”. In “Angel Crush”, a fallen angel impregnates an Atlanta woman, and her family and friends battle with the horror of it all. In “Son of the Rock”, the child (Khalid) is 8 years old wrecking havoc on everyone around. Death and destruction follows him everywhere. In “Archfiend”, Khalid is now a 16 year old college student and his dark powers are becoming more dangerous by the day. Each book can stand alone, but reading from the beginning provides more insight and, depth of character. 7. Your book ” Tales of a Numinous Nature: A Short Story Collection” contains horror stories. Are all of the stories in it horror? What kinds of supernatural creatures are in them? Nine out of ten are horror stories. The book has ghosts, vampires, mysterious spirits, demons, and figments of the imagination. 8. Which of the stories from ” Tales of a Numinous Nature: A Short Story Collection” do you think our readers would find most terrifying, and why? That’s hard to answer. It’s all according to what scares a person. I have a story called “Bloody Mary” where a dead girl is murdering her murderers. I also have one about a demon taking over a night club ( “The Road Not Taken”). I prefer humorous supernatural like in “The Man Didn’t Get Granddaddy”. ~ by Sumiko Saulson on December 14, 2017.